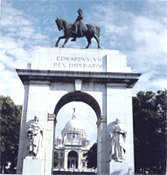 Built entirely of white marble, Victoria Memorial, one of India's most beautiful monuments, represent a unique combination of classical European architecture and Mughal motifs. The domed and white marble museum sprawls over 64 acres and is set in a landscaped garden at the southern side of the Kolkata's maidan (ground) near Jawaharlal Nehru Road. Designed after the Taj Mahal in Agra, it has a vast collection of pictures, statues, manuscripts, letters etc, relating to the Nawabi and British times in Bengal. The memorial was the inspiration of Lord Curzon, who in 1901, felt that his recently departed Queen Victoria, required a suitable monument to her memory. She was the first British monarch to be awarded the title of Queen-Empress of India in 1877. The building was designed by Sir William Emerson President of the British Institute of Architects. Vincent J Esch, an assistant Engineer in the Bengal Nagpur Railway, was the superintending architect and the work of construction was entrusted to Messrs Martin and Co of Kolkata. Lord Redesdale and Sir David Prain designed the gardens. Though the construction of the building substructure began in 1904, it was completed only after 20 years at a cost of 10 million rupees. The Prince of Wales formally inaugurated it in 1921. Set amid 64 acres of lawns, fountains, and herbaceous borders this greatest symbol of the British, houses artifacts illustrating British roots in India. The building covers an area of 103.02m by 69.49m. 196080cft of Makrana marble was brought from Jodhpur, Rajasthan for its construction. It has been calculated that a goods train about 27 km long would be required to bring the entire building materials needed for the memorial. Statues of former British rulers sculpted by Italian craftsmen that used to adorn street corners all the way along Chowringhee and the Maidan, are now scattered around the large garden of the monument. The 'H' shaped memorial consists of numerous hybrid features; it has Italian-style statues over its entrances, Mughal domes in its corners and tall elegant open curved colonnades along its sides. There are 3000 exhibits in 25 galleries in a chamber beneath the dome. Main entrance is from the north. A bronze statue of Queen Victoria sits enthroned in bronze at the entrance marble staircase wearing the regal Order of the Star of India. Above her, a black bronze angel known as Victory, holding a bugle in her hand was placed at the apex of the dome above the Memorial and has always been regarded as a curious addition to the monument. It is fixed to its pedestal with ball bearings and rotates when the wind is strong enough. The entrance dome is deeply graven with the text of Queen Victoria's imperial proclamation speech. Inside the memorial there is a remarkable collection of artifacts depicting British Imperialism - statues of famous British figures including Robert Clive, General Stringer Lawrence, Lord Bentick, William Makepeace Thackeray, who was born here, Florence Nightingale, Queen Mary, George V and Queen Victoria etc. Many of British India's Governors and Governor Generals are represented here in stone, dressed in Roman togas, like Clive, Warren Hastings, Cornwallis, Wellesley, Dalhousie etc. Excellent paintings such as, Burne-Jones's portrait of Rudyard Kipling, Johann Zoffany's portrait of William Hastings and his family, Macaulay, Bishop Heber and William Hickey, Verestchagin's monumental depiction of the Prince of Wales making his grand tour of Jaipur in 1876, the works of the Victorian artists Thomas and William Daniells, paintings of Robert Clive, marriage of the Prince of Wales with Princess Alexandra are exhibited and a huge painting depicts King Edward VII entering Jaipur in a regal procession in 1876. French guns captured at the Battle of Plassey are on exhibit along with the black stone throne of the Nawab whom Clive defeated. Also on display are some Indians without discrimination. Among these are - Keshab Chandra sen, Michael Madhusudan Dutt, Rabindranath tagore and his grandfather Dwarkanath Tagore. In the Royal Gallery there are many oil paintings illustrating episodes from Queen Victoria's long, eventful life and reign- her coronation in the Westminster Abbey in June 1838; her marriage with Prince Albert (1840) in the Chapel Royal at St. James' Palace; the baptism of her son, her son's wedding, her residence of Frogmore, Queen Victoria at the first Jubilee service in Westminster Abbey in 1887 and the Second Jubilee service of Queen Victoria at St. Paul's Cathedral, June 1897 etc. Some of her possessions, like the pianoforte, at which she received tuition in childhood, her personal writing desk and chair occupied for daily correspondence at Windsor, scrapbooks of her letters in Hindustani, for Queen was tutored in the language by her favorite Indian attendant Abdul Karim, the last letter she wrote to her people in India etc. The memorial is famous for its exhibits of Indian and Western Paintings, manuscripts, postage stamps, Mughal miniatures, books that dates back to the 1870's, statues and sculptures, arms and armaments, sketches and other objects of historic value in its Museum and Art Gallery. Today it is one of the main attraction for tourists in Kolkatta. Here, on weekends, people picnic, families meet, and transiting pilgrims bring flowers to the statue of "Maharani Victoria". Two regular sound and light shows both in English and Bengali are held in the evening. The memorial is open from 1000 am to 1700pm on all weekdays except on Mondays and public holidays. For Indians the entry fee to the museum is Rs.10/-For all foreigners the entry fee to the museum is Rs.150/-. The Memorial is an autonomous body governed by a Board of Trustees with the Governor of West Bengal as the Chairperson, and is under the 'administrative control' of the Ministry of Culture, Government of India.